In this tutorial, we are going to create a website product page using HTML, CSS3 and jQuery. You can use it for product presentations on your shop website. In this tutorial, we’ll use Google Fonts, specifically Roboto. Make sure to include the typeface before you start. Ok, let’s wrap everything in a `.container` class. Now let’s go to the next step where we’ll make it look awesome. Add basic styling to the body. Notice that `.container` has been set to `display: flex` which will align the columns. Now let’s add some width to columns and `position: relative` the `.left-column`, because we will `position: absolute` the images. Great! Let’s style the first column, which is `.left-column`. This column has three images, three headphones in different colors. We’ll give them `opacity: 0` and also add a class `.active` on them with `opacity: 1`, which we’ll need it later in this tutorial. Style the `.right-colum` now. Begin with `.product-description` where we describe the product. Now, we need to style the product color configuration. Here, we have three radio inputs, we’ll style them to look nice. 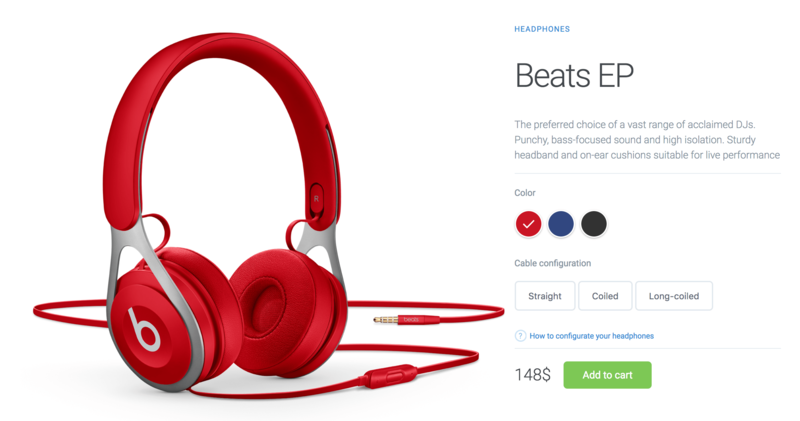 Each input will have a color that pairs with the headphones color. We’re going to use `:checked` to add a checked icon on the checked radio input, `:checked` is an awesome feature which CSS provides. Good! Now let’s style the `.cable-configuration` section. We have three buttons and a link. Let’s style their states and make them look nice. One last thing to do is to style the last section of this column, which is `.product-price`. The last thing we need to do is to make the images change when we click on a color, so that the checked radio input color matches with headphones color. This uses jQuery, so make sure to include it in your project. We’ll use data attributes to work with. Notice that we add the class `.active`. I mentioned earlier everytime we click on the matched color. Awesome! We’re done here! Feel free to use this in your projects. Take a look at the demo and let me know what you think in the comments. I’m a Front-End Developer from Arad, Romania. I am passionate about everything related to Web Development. Huge coffee lover. Looks nice. Add some interaction (like fancybox for swiping and zooming) and it would be perfect. Most likely there is/would be a lot more code in the full website. I know what you mean though, most of the time jQuery isn’t needed. How do you use this on a page with multiple products?